Since olden times there was a Martial Art called Toshukuken(The hand protecting the body) handed on from father to son in the island of Ryukyu, an ancient name for Okinawa. From this art two styles were born: one in Shuri and the other in Naha. The former was called "Shurite", the latter "Nahate". 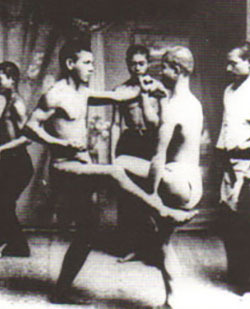 While the Shurite style was only marginally influenced by Chinese Kenpo, the Nahate has been regarded as genuine Chinese Martial Art. 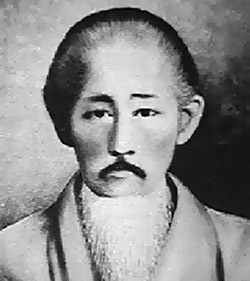 The most important representative of Nahate style was Higaonna Kanryo, born at Naha in 1853. 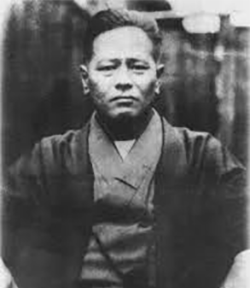 In 1877, when he was 24 years old, he was sent to China, in Fukkensho Fukushu province (according to Japanese pronunciation) where he trained for many years with Ryuryoko Roshi, famous Kenpo Master. 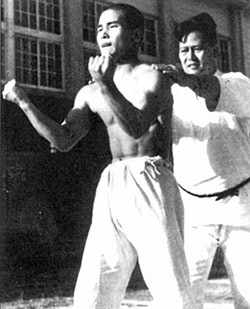 As far as we know, this is the opening of Goju-Ryu history. 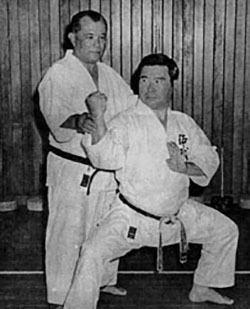 One of the first students of Higaonna Kanryo Sensei was Miyagi Chojun. He was born at Naha on April 25th, 1881, studied with Higaonna Sensei from September 1902 to October 1915 and then, following his Master's example, he left for China on November 1915. It was one year of intensive study, during which he got in touch with all the great leading families in Chinese Kenpo. Miyagi Sensei devoted himself entirely to the study of Karate, in a never-ending research, giving up all his possessions and developing Nahate to higher and higher levels till he founded "Goju-Ryu Karatedo". He will forever be remembered as one of the leading figures of Karate all over the world. "Go" is "Strong" and "Ju" is "Soft"; "Goju-Ryu" is therefore "A Style alternating movements full of strenght and power to smooth and graceful ones". An all-round style, well balanced and up to shaping a body tough and resilient, without the inevitable stiffness of the other styles. All the attacking and receiving techniques are developed through circular movements, with the purpose of increasing the power of the blow and avoiding the opponent's attack by getting into his guard and throwing him out of balance. On the contrary the abdominal breathing is a study and a training of the inner body: we learn to control our energy easing the function of the main organs with an healthy massage.